A panel of experts in facial plastic surgery procedures respond to questions regarding their approaches, techniques, outcomes, and overviews of specific procedures. Surgeons address cosmetic and reconstructive surgeries in Neuromodulators, Hair Replacement, Upper Face Rejuvenation, Blepharoplasty, Le Fort Fractures, Implants, and Auricular Deformities. 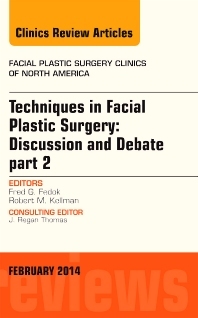 This is the second of a two-volume presentation, the first volume presenting topics covering Rhinoplasty, Revision Rhinoplasty, Facelift, Midface Lift, Chemical Peels, Laser Resurfacing, Lip Augmentation, Mandible Fractures, Subcondylar Fractures, Facial Reanimation, Injectables and Fillers, and Fat Grafting.